Brush strokes can be wide or very thin depending the one you use. The weight of the paint and whether it is opaque or transparent also will give you the effect you are looking for. Depending on the texture you are trying to create the brush is just as important as the thickness of the paint. First you must start with a strong underpainting and work towards getting the results you desire. Starting out I cover wide areas with shapes of colors by using one that is wide flat rectangle. Using a verity of strokes I work up textures from that foundation. The brushes you use depends which ones work the best with the control you have over them. Using short strokes with a thin angled brush defines lines and sharp edges. I use a thin round long pointed brush for very thin brush strokes. 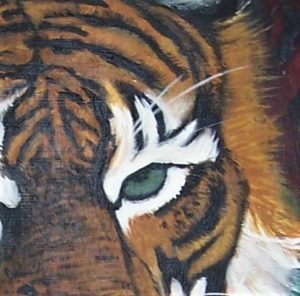 I paint animals and one of the best part is that I can create an image just from the colors and how I apply them to the canvas. I try to keep my strokes going in the same direction that I see in the fur of the animals. By working up from the shapes I use the colors I see and apply them in layers. I reaffirm the shape of the subject by building the highlights up in the fur making a believable image. Texture that you see can be duplicated with little effort with practice and by mastering the use of the tools at hand. Remember that different paints and glazes will give you so many options depending on the texture you’re after. Adding sand or fibers to the paint can also change the textured effect. Thicker paint and using a pallet knife or even your hands may give you the desired texture you’re looking for. Texture builds with every brush stroke showing color and direction of the fur. 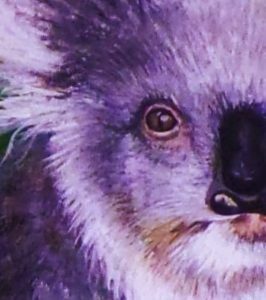 Using brush strokes and layers of color to create the texture of fur. You can see the whole finished paintings in my acrylic gallery here.